Becca and Brian's Grand Adventure: Cane Toads! 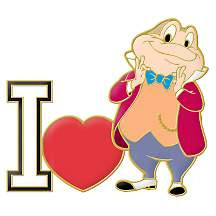 Brian and I are fans of toads. Whether it's enjoying Mr. Toad from the Wind in the Willows, listening to the croaks as we tried to fall asleep along side the Laotian riverbanks, or using Toad as an endearment for each other, the hoppy creatures seem to play a recurring small role in our lives. 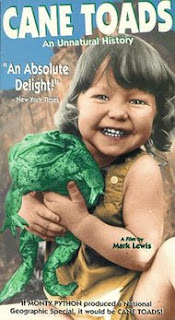 So when Seth recommended the documentary "Cane Toads" about that animal's ill-fated introduction into Australia, we were game to check it out. Dr. Kerr - One of the men who, back in 1932, thought the cane toad would solve Australia's sugar cane pest problem. He was wrong, but goes on merrily collecting his pension while the poisonous toads muck up the continent's ecosystem. Dr. Archer - A specialist in the study of small rodents. 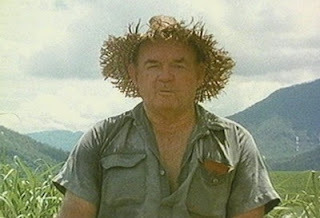 He carries a grudge against the warty invaders ever since his marsupial native cat gnawed on one and subsequently died. Here's toad juice in your eye. Syd - Police detective involved in the prosecution of drug users. Lick the toad and get five years mate. David and Elvie - Two weirdoes who love the confounded little monsters, even waxing sentimental while talking about them. One of the upstanding folks sharing cane toad tales. -- Watching an overly amorous male cane toad riding his chosen female. The only issue is that the female is dead. and road kill. and have we mentioned FLAT??!! -- Learning that one of the towns had wanted to build a big cane toad statue as a tourist attraction to compete with the big prawn, the big banana, and the big ball of string, etc. 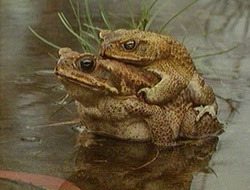 Cane toads getting it on. As the strange people and their strange stories kept appearing we kept asking ourselves how this could not be a mystery science theater-type event. We even stopped in the middle and looked it up on IMDB.com to make sure it wasn't a Christopher Guest-style mockumentary (like Best in Show or Spinal Tap). But no, it appeared that it was actually for real. 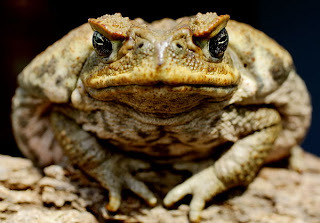 So if you're looking for a little bit of education with a large dollop of riduculousness packed into less than an hour, pick up Cane Toads, An Unnatural History from your local library or video store. And be prepared to be bemused. Big, ugly, horny, and able to secrete a deadly poison. "You want some of this??" And a definite steal at 21,99 USD from Amazon.com !